Why do some like jazz and skydiving where others want romcoms and package holidays? One person’s bore is another’s thrill, and personality is key to uncovering why. Openness, Conscientiousness, Extraversion, Agreeableness and Neuroticism (OCEAN for short) – the ‘Big 5′ model is the world’s most researched personality paradigm, and – alongside other theories – the psychological basis for VisualDNA’s understanding of people. At VisualDNA, our in-house psychologists and big data experts have distilled 30 years of personality psychology research, building new methodologies alongside scientists from University College London, Cambridge University, and Columbia University. Our ‘Big 5′ infographic shows how people, however demographically similar, think, act, and move in unique ways. With our new layer of understanding, we’re helping brands and businesses understand what customers want to do – and, crucially, how they want to do it. VisualDNA quizzes are based on images to deliberately trigger a rapid, emotional reaction from deep in participants’ subconscious. In-depth, unincentivised and free to take, VisualDNA quizzes have an 80% completion rate and reach millions through viral spread. VisualDNA quizzes conclude with a psychological reflection of the participant’s personality make-up. We recommend books that’ll expand the mind, highlight likely workplace issues, and focus on key life areas including down-time, finance and romance. Though the psychological insights fed back are accessible, insightful, and entertaining, they’re firmly rooted in academia’s leading psychological principles; including the ‘Big 5′ model. Around 40m people have now taken a VisualDNA quiz, giving us the largest personality database anywhere in the world, enabling us to connect personality type to behaviour so we can predict who people are and what they’ll do. VisualDNA’s Credit & Risk predictive models are designed to predict real life financial outcomes. The question development process involves multiple stages of testing to ensure that only the most relevant and powerful options make the final cut. For a 40 questions quiz, as many as 200 questions are mooted and 80 are trialled before final review. From the outset, qualitative tests ensure question meanings and interpretations are sound across the geographies in which we operate. Symbols of luck and fortune vary greatly between cultures, a surprising example is that UK-based under 20s didn’t identify the horseshoe as a good luck icon – so online focus groups as well as real world interviewees enable us to learn and record cultural quirks and perceptions and the way people interact with ideas, questions and products. Before a question makes it to a live environment, we ensure its predictive power in quantitative online tests where we assess both the scale validation of the new questions, as well as their risk prediction. Scale validation is carried out to confirm the correlation of the newly developed image scale with established scales of personality. Risk prediction is assessed through the correlation of questions with financial information contributed by our sample panelists – questions that perform well throughout the testing process graduate to the final product. Final models are built based on live environment data, and provide accurate, robust and sound predictions for future financial behaviour. Out in the world we can learn a lot about a person from just a glance: a flashy watch, a modest bag, a quick wit or a relaxed verve – we infer much about someone from how they look, walk and talk. 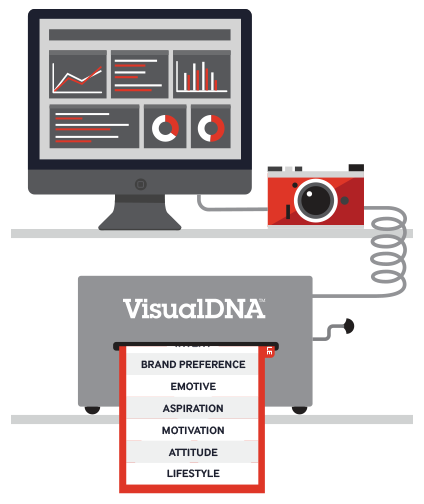 With VisualDNA tech, you can do the same online. When someone takes a VisualDNA quiz they generate a detailed and accurate snapshot of their personality. By then analysing that person’s online behaviour we can build up a unique, three-dimensional portrait of who someone is, and build on it to infer who others are. Exponentially expanding data on the relationship between behaviour and personality, and vice-versa, we can discern an unknown users’ personality type from their behaviour, and we can then predict a person’s behaviour by relating it back to their character type. The tech has given been key in unlocking millions – about 340 million in fact – web users as real people. This process is VisualDNA’s Behavioural Inference Engine – developed in conjunction with the University of Cambridge – at work. By accurately inferring personalities and behaviours, brands and business can add value to the online experience. Unique to VisualDNA, the DIIP data approach paints a holistic, rounded picture of individuals. 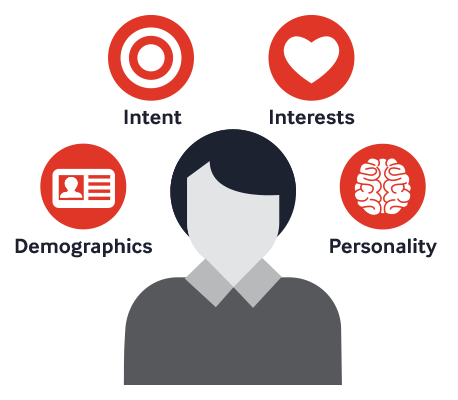 Where others specialise in one or more of Demographics, Interest, or Intent data, VisualDNA incorporates all and adds personality, giving us full perspective on every aspect of human behaviour. ‘Wine’ in Waitrose may indicate partakers of Chateau Lafite, ‘wine’ at Tesco may be part of the weekly shop, ‘wine’ in the Daily Telegraph may mean an article on the grape season. These searches all indicate greatly different personality types. With DIIP data, we can be three times more accurate in describing readers for publishers – and five times more accurate describing retail customers. The information boosts any business’s ability to service customers based on how they think, as well as who they are and what they want, adding an extra understanding to the generic and contextual data already out there.